Design your own backpack with this durable, water-resistant bag made from material you can draw on. The best part about a cast: Getting it signed by all of your buddies. The worst part: Earning that plaster badge of coolness. Give your friends and family a fracture-free place to leave their marks with this durable bag made from doodle-on-able material. 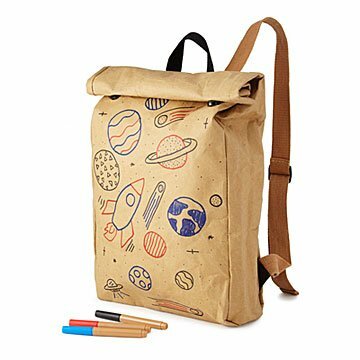 It's big enough to use as an everyday book bag, and the kraft "paper-leather" fabric absorbs permanent ink. It's even tear-proof and water-resistant. Since the backpack starts as a blank slate, it makes a fun gift for all ages—from young kiddos who can't stop coloring to teens who don't want to wait for the yearbook to start collecting signatures. It's also a clever guest book alternative for the college-bound graduate. Three non-toxic markers are included, but artists can get creative with paint or other alcohol-based inks. (The bag is hand-washable, so skip the ballpoint pens, they'll bleed.) Designed by John Knauss. Made in China. "I've been a professional stage actor, artist, director, writer, and educator. In 2017, I decided to try my hand at designing something to encourage individual expression and creativity in ways I hadn't seen before," explains John Knauss. While looking for ways to encourage individuality, John also started thinking about how to bring people together while highlighting what makes each person unique. “In a time when we are both more connected as well as disconnected, I want to find new ways to build community and return to the simpler things we may have forgotten over time with the pace of life increasing," he says. Having lived in more than 20 countries, the designer, who is now based in Florida, wanted to make a product that could be used by anyone, anywhere. Then he had an idea for a design that could only be limited by the imagination: I'd noticed various papers were starting to be used more in the fashion bag industry but no one was doing what seemed the obvious thing to me: inviting people to write on their surface!" The result was the Draw Bag, a wearable way to express yourself that becomes completely unique for each person and each way it's used.